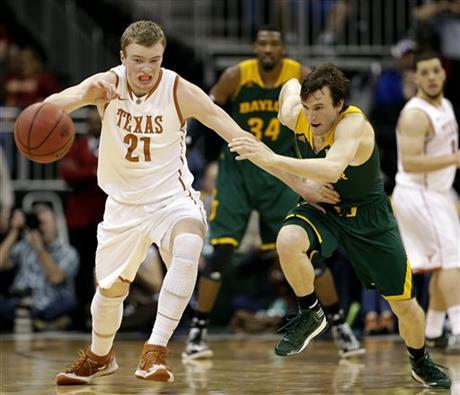 The match-up for the Big 12 Tournament final was set in Friday’s nightcap, which saw Baylor dismantle Texas 86-69 in Kansas City. The Bears continued their strong play of late after their midseason struggles, and as a result, they’ll attempt to become the first team to take the Big 12 Tournament crown by winning four straight games. Oddly enough, Baylor was the last team to attempt to pull off that feat in 2009, but the Bears fell to Missouri. Baylor continues to add strength to its resume. In early February, Baylor’s resume was falling apart. Wins over Kentucky and Colorado were neutralized by losses to Texas Tech and West Virginia, and a cloud of panic and disappointment started to settle above Waco when the Bears lost eight of their first 10 conference games. Now, though, Baylor has reeled off 10 wins in its last 11 games to silence the skeptics (of which there are certainly many). Not only is Baylor firmly off the bubble, but the team’s stock is rising rather quick. It isn’t difficult to picture enough things breaking for them to enter NCAA Tournament play as a #5 seed, provided they take care of business against Iowa State in the final. So what’s been the difference? The Bears’ offense is clicking. On Friday night, the Bears’ offense registered 1.37 points per possession, its highest mark since a 1.42 PPP showing at West Virginia on February 22. All told, Baylor’s offense has tallied at least 1.04 points per possession in each of its last 12 outings, while their defense has been steady if unspectacular. Cory Jefferson has come on especially strong and was fantastic tonight, notching a double-double with 20 points and 13 rebounds against Texas’ strong interior defense. Combine Jefferson with Isaiah Austin, one of the country’s top three-point shooters in Brady Heslip, and a highly capable supporting cast, and the result is a combination that is good enough to beat any team in the country. Texas continues to trend downward: The Longhorns were one of the toasts of this season after starting the campaign with an 18-4 record and Rick Barnes cooling the seat under him in the process. Barnes reaped the rewards of his squad’s turnaround by winning Big 12 Coach of the Year honors at the beginning of the week, but it’s been a slightly different story now that Texas has dropped five of its last seven games. Isaiah Taylor, Javan Felix and Jonathan Holmes have played well in spurts, but getting everyone on the same page offensively has been a struggle lately. Taylor was able to leak into the cracks of Baylor’s zone tonight, showing inspiring confidence as a freshman and leading the team with 16 points, but inconsistency elsewhere in Texas’ backcourt (Felix and Demarcus Holland went a combined 1-of-7 of the floor) along with a poor showing from Holmes put the Longhorns in a hole at halftime and they just never recovered. This entry was posted on Friday, March 14th, 2014 at 11:45 pm by Brian Goodman	and is filed under 2014 conference tournaments, big 12, microsites. Tagged: baylor, big 12 tournament, rick barnes, scott drew, texas. You can follow any responses to this entry through the RSS 2.0 feed. You can leave a response, or trackback from your own site.